NEW YORK, 16 May 2012 – The National University of Malaysia(UKM) today signed a memorandum of understanding (MoU) with the New York Academy of Sciences (NYAS) to forge strategic alliance for developing Nobel Laureate mindset among UKM’s PermataPintar students. In another signing UKM representing Malaysia Research University Network (MRUN) signed with NYAS and the State University of New York (SUNY) for ‘cradle to career’ programmes. UKM Vice Chancellor, Prof Tan Sri Dato’ Wira Dr Sharifah Hapsah Syed Hasan Shahabudin signed for UKM and MRUN. SUNY was represented by its Chancellor, Nancy Zimpher while NYAS by its President and Chief Executive Officer, Ellis Rubinstein. The ceremony was held at the New York Academy of Sciences at the World Trade Center in conjunction with the Second Global Innovation and Science Advisory Council (GSIAC) meeting here. 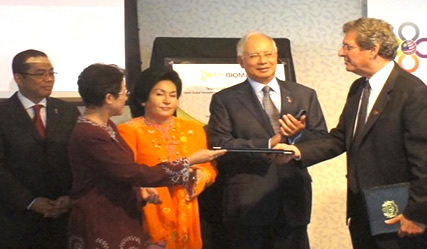 The signings were witnessed by Prime Minister, Datuk Seri Mohd Najib Tun Abdul Razak who is on a working visit to the United States and Datin Paduka Seri Rosmah Mansor who is also the Patron of PermataPintar. The MOUs are also to establish Laureate-in-Residence programmes at PermataPintar and setup Pintar Labs at selected Malaysian Research Universities for mutual advancement of fundamental research to enable PermataPintar students and researchers of Malaysian Research Universities to undertake programmes at NYAS to strengthen STEM (Sciences, Technology, Engineering, Mathematics) skill sets. Exposure to international science and mentoring programme under world renown Nobel Laureates are important elements of creating the next generation of scientists. Experts agreed that exposure to research through career exposure, introduction to lab skills and lab culture and mentoring by role models is a more effective method of inspiring the next generation of scientists. The New York Academy of Sciences is reputed to be one of the world’s nexus of scientific innovation in the service of humanity and had brought together extraordinary people working as the frontiers of discovery and promoted vital links between science and society. It is not only a notable and enduring cultural institution in New York City but also one of the most significant organisations in the international scientific community. Present at the signing ceremony were Minister of Higher Education, Dato’ Seri Mohamed Khaled Nordin; Science Advisor to the Prime Minister, Prof Emeritus Dato’ Dr Zakri Abdul Hamid and Malaysian Ambassador to the United States, Dato Seri Jamaluddin Jarjis.